Whether for practice drills or a real threat that has entered your school, having supplies on hand in each classroom makes dealing with the situation a little bit easier. When you're not even allowed to leave to use the bathroom, that is when everyone will need to use the facilities. 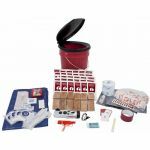 Having a makeshift bucket latrine will ease that concern for those really needing to go. 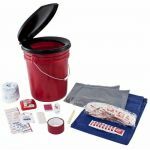 Included in these buckets is a first aid kit as well as sanitation supplies such as wet napkins, tissue, and hand sanitizer. The Deluxe version even includes food and water for 30 students.